In all my years of conscious recollection (ie. school age onwards), I have never lived without snow. Oh, yes, of course Saskatchewan has its hot summer days, and crisp autumn days, and even the occasional day of buds on the trees that could be called “spring”, but winter is the most repeated and most dominant note in the symphony of our year. We moved to Regina from British Columbia (where, as my mom so often longingly recalls, they have “daffodils in February”) in 1978, when I was nearly five, and then I attended university in Winnipeg, Manitoba (also known as “Winterpeg”) from 1991 to 1995, and did spent 9 months studying and doing volunteer work in Lithuania before returning to my home province. And now my husband and I live in La Ronge, which is northern (aka cold) by any definition, unless you happen to live in the Arctic. I have lived through through days of -50 Celsius here, so don’t go questioning my understanding of cold! The romance of snowy days fades quite quickly after a few weeks of trudging through jagged-edged drifts hard-packed by passing snowmobiles – on what were once (in sunnier days) known as “sidewalks”. But I do still experience a sense of joy in tasting the first few flakes of icy wetness, or noting, as I glance down on a cold, sunny day, all the tiny sparks of light glinting on the ground ahead of me. And today, I saw a grin on my 9-month-old daughter’s face, even though she was sitting in her car seat on the snowy driveway, on a -11 day. She was born on a late February day, in this chill-swept province, and she has come through a winter, through summer and autumn, a bit of winter and then a brief, glorious period of Indian summer. And now here she is on the other side of that, with a smile on her sweet little face, just below her red-tipped button nose. I can wish to be lying on the white sands of a Caribbean beach, or taking a siesta in Mexico, but for Sara, this is life as she knows it – and it’s my life too, right now. So I’m going to try, this year, to pay more attention to what’s around me – to the evergreens and snow-covered bedrock in an uncleared stretch of forest across the street from my house, to how adorable my daughter looks bundled up in her purple jacket and her Saskatchewan Roughriders blanket, to the vast, gorgeous frozen lake I see every day (if I look!) when driving through downtown, and to the gloves I tend to forget at home and the cupboard full of tea and coffee and hot chocolate that I can brew when needed. But I’d still take a plane ticket to Cancun, if anyone’s offering! I am making a commitment to myself this year to chronicle my Christmas. This is a remarkable season – filled with mystery, poignancy, history and traditions, expectations both met and unmet (whether you were awaiting the latest electronic gadget), pain and joy. It is a season in which much is magnified, in which the insignificant becomes significant – and sometimes that’s the trauma of what’s to be done with the turkey leftovers or why cousin so-and-so failed to send a card this year, and sometimes it’s shepherds staring open-mouthed at a night sky recently vacated by angels, and a baby born to a peasant girl in an obscure town who would become the Savior of the world. What I want to record is both my day-to-day experiences over the next month, and reflections on the bigger picture – memories of past Christmases, my feelings and impressions, and what matters to me about this season. I already know that this year will be different in two major ways: this is my baby girl’s first Christmas, and because of my sister-in-law Pauline’s at-risk pregnancy and the need for my mom and dad to fly out to B.C., it is also the first in 15 years that I won’t be with either my parents or my brother on Christmas Eve or Christmas Day. 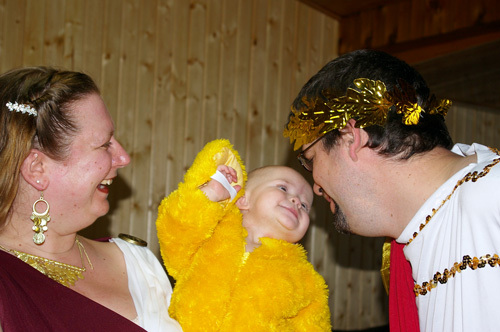 There is also a good chance that this will be the last December that we are living in La Ronge, Saskatchewan – the small northern town where Bryan and I have spent the first 12 years of our marriage. I want to make this season very special, and I know that even in committing to that, I run the risk of disappointing myself. But Christmas is not about perfection – it’s about anticipation, commemoration, and ultimately, a baby. I have my own miracle child to celebrate with this year, and I think that will make delighting in the birth of our Savior – and all the festive trappings that have built up over the centuries, and point to (and sometimes, unfortunately, obscure) the “reason for the season – special in and of itself. My mantra this year is, “Keep Calm and Merry On”! So – on to Christmas! Thank you all for making me feel so welcome in the blogging “neighbourhood” — it’s been a treat to read your comments, and I look forward to having a chance to comment on all the other inspirational layouts in this blog hop. I was hoping to have some time to play with “paper and pretties” tonight, but that’s not how my day went. I poured most of my energy today into playing on the floor with my baby girl, cleaning the kitchen (urgh — it was such a mess, and the rest of the house isn’t much better right now), sorting laundry and taking part in my daughter’s beginner swim class. She is the tiniest one in her class, but amazingly confident in the water already. She has figured out the proper leg and arm movements and goes “swimming” (with me holding her up) enthusiastically after the balls and toy boats, watches the instructor and the other kids (like her 2-year-old cousin Theo and one of the girls who goes to the same babysitter) carefully to see what they’re doing, and is a good sport in the game/song times (we do songs like “Motor Boat, Motor Boat”, “Bingo” and the “mm mm went the little green frog” one, adapted for swimming practice). She even tried a bit of bubble-blowing today, although she hasn’t quite figured out how it’s done. I love seeing her wet and grinning, and squealing happily in the water. I am eager to learn more about the art of blogging — it’s still a very new “medium” for me, although I did attempt it a few years ago, only to abandon the effort because I couldn’t figure out what I wanted my blog to “be”. When I tried using it as a diary, I ended up writing mostly when I was feeling sad or overwhelmed, and that didn’t present a very balanced picture — and it was also weird having posts like that so “out there”. And when I thought about using a blog for sharing crafty projects, I felt as though I wasn’t making projects consistently enough to make that worthwhile. I’m still wrestling with what the content here will be. I’d like to strike a healthy balance between open, honest sharing about my everyday and yet not being “too” personal, and also have a place to talk about ideas and experiences I have had in the past or am now having, and share my projects and some of the rationale/thinking behind them. Any advice from those who’ve “been there” would be greatly appreciated. 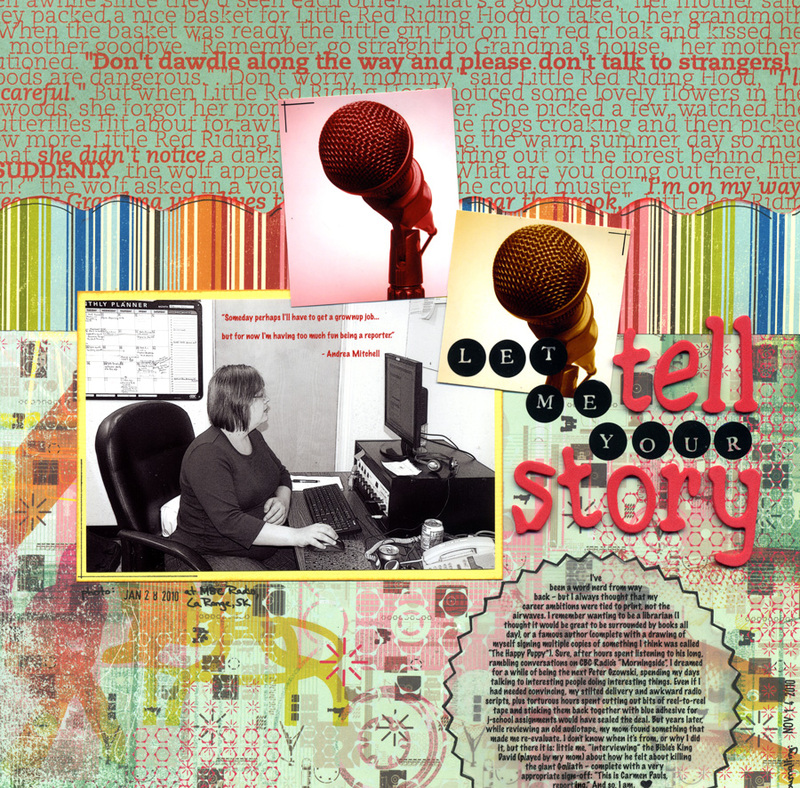 With that in mind, I’ve decided to try Shimelle Laine’s Blogging for Scrapbookers class. I’d love to hear from anyone who’s taken the class, and/or interested in talking about it. It’s now one of her archived classes, so there isn’t ongoing discussion on the forum as far as I know. So if you’re planning to take it, let me know — it would be great to have others to bounce ideas off. Anyhow, thanks again for the comments — they do my heart good.